What is the Auditory Feedback Loop? Have you ever had a cold and had the experience of not being able to hear your own voice clearly, or been so stuffed up that you couldn’t say certain sounds (“my mom” becomes “by bob”)? Have you ever caught yourself using a word you didn’t mean to in conversation and repeating the sentence to correct yourself? 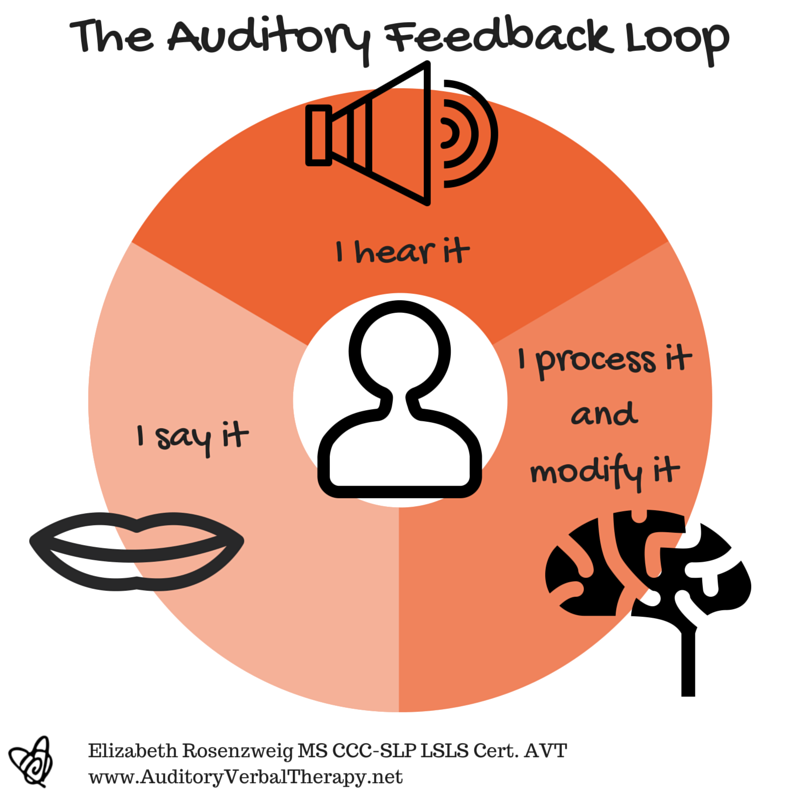 If you have, you have experienced the Auditory Feedback Loop (AFL). Listening to, processing, and correcting our own speech and language is an important part of being a good communicator. How can we help children with hearing loss develop this skill? I visualize the Auditory Feedback Loop as a three-part cycle that continuously goes around and around as we listen and talk. The Auditory Feedback Loop is so important for all of us. Even a few milliseconds of delayed audio feedback is enough to through even a seasoned listener unable to communicate (think about a bad cell phone connection when you can hear your own voice). Research shows that hearing device users’ speech changes within seconds of removing their devices. If seconds cause a change, think what damage minutes and hours can do! Step one for developing the AFL is to make sure your child is hearing well with her hearing devices and using them all waking hours. One of the unique features of Auditory Verbal Therapy is that it enables children with hearing loss to learn to talk through listening. One of the main ways we do this is by developing the child’s AFL. If you are talking into a vacuum and never monitoring your own speech, it’s hard to improve without direct instruction. Who wants to be corrected by others all day, every day? Not I! If we can help a child learn to listen to, monitor, and change his own speech, he can learn far more (and far more independently!) than he ever could with us nagging him. That sounds like more fun for everyone, doesn’t it? Building the Auditory Feedback Loop is an investment. It gives the child skills to become a lifelong listener and to continue monitoring, improving, and correcting his speech and language long after he leaves the therapy table. This entry was posted in Elizabeth Rosenzweig MS CCC-SLP LSLS Cert. AVT and tagged Auditory Development, Auditory Verbal Therapy, Children, Hearing Technology, Infants, Parents, Professionals, Speech Development. Bookmark the permalink. I liked your suggestions on how to develop the AFL. What about recording the child and having them listen to the recording to try and make he correction? Would this be helping to develop the AFL? Thank you, Heidi! While, in general, the brain doesn’t process recorded/electronic voice the same way as live voice (we prefer to listen to live voices), for a tween/teen/adult, taping yourself and watching it can be a good way to self-monitor, especially for things like class presentations. Live voice “external auditory feedback loops” provided by parents or other adults are still important, though!